no doubt something of a legal minefield, the trade descriptions act was introduced in 1968 to protect the hapless consumer from the vicissitudes of predatory manufacturers, retailers or perchance, service industry providers. for, as we all recognise, the latter's sole purpose in life is to prevent the great unwashed from being able to purchase the very goods which they have advertised as being fit for purpose. according to the act, products sold must be as described, of satisfactory quality and fit for purpose. any advert or verbal description must match that depicted by the trader, or the law will not be a happy chappie, and wrists will be in danger of being smacked. that being the case, i think i may have a legitimate case for complaint. normally, i would attempt to solve any problem of this type by contacting the manufacturer directly and pointing out the error of their ways, preferring to come to some amicable agreement rather than dragging their hard-won reputation through the metaphorical dirt. but with the case in question, i adjudged it more prudent to warn the cycling public in advance. for i believe that said manufacturer would wish to stifle my cries of 'foul', as such could adversely affect their admittedly finely crafted sales ploy. now i should make it plain that the product in question is not faulty in any way; quite the contrary, the merino socks to which i refer, are quite possibly the finest example of their genre i have had the good fortune to wear. i distinctly remember, several years ago, telephoning the incumbent sales operative (such a demeaning term; the lady to whom i refer was, and probably still is, one of the nicest i have met) to effuse over an earlier version of the selfsame product. it may be the decent thing to point out that the current item's ancestor gave no cause for concern in either quality or manufacturer's description, and is thus exempt from the current discussion. it cannot be denied, however, that the current merino socks, in three alternative, yet fashionable colours do not fit the manufacturer's description. let me elucidate, if you will. after a morning from printer hell, having spent nigh on four hours attempting every variation possible to send an a3 publication to a networked colour printer and failing miserably, the only available solution was to take the rest of the day off and commute to bruichladdich village for a soya cappuccino. notice my use of the word commute in this context; i'm sure i could have described my cycle trip as a jolly but that would surely demean the importance of the coffee as an escape from the morning's tangible misery. as mrs twmp was expecting me to return for tea, i have no real choice but to describe my return trip as a commute, and i'll happily argue till the cows come home with anyone who says different. my morning attire was that becoming of a pre-press professional in a rural economy, and i could see no reasonable argument that would provoke me into swapping this mode of dress for one more becoming of a pelotonesian. commuters simply don't do that sort of thing. there's no getting away from the fact that a pair of rapha cotton trousers have legs with an almost magnetic affinity for chainrings and chain oil. the best methods for disturbing this state of affairs is either to roll the offending trouser leg up towards the knee, or more funkily, to tuck it inside the right sock. 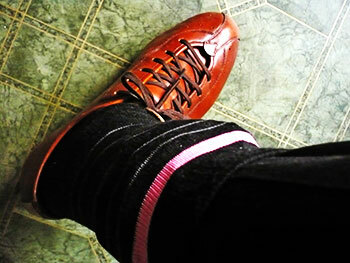 in order to accomplish this, the sock needs to be of commensurate length, a feature that rapha's pink and black, fig and yellow or morroccan blue and white have in abundance. 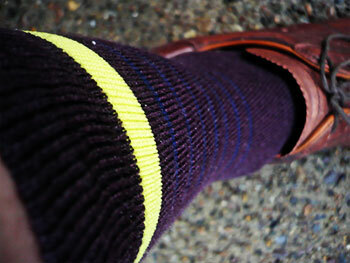 and should your street cred stretch to turning over the sock's top, the word rapha can be plainly seen in the knit. all seems to be hunky dory so far. my regular reader will, by now, be thoroughly au fait with the route between bowmore and bruichladdich villages, taking in the exposed expanse of uiskentuie strand, with dunes on the left and mountainous raised beaches on the right, both peppered with freely roaming sheep and cattle; the rural idyll, if you will. it is here that i take exception to rapha's website description and where i feel legal redress may be in order, for perren street describes the items in question as city riding socks. my above described route surely lays rest to that erroneous description; nowhere is there a building greater than three storeys high; nowhere is there a set of traffic lights, a roundabout, the gas, electricity board or british telecom digging up the road; nowhere is there a belligerent taxi driver intent on confining my cycling to the gutter, and if i choose to leave my bicycle unlocked outside debbie's, i know for a fact that it will still be there when i come out again. quite plainly not the city; in fact, not even a town. i will therefore be contacting my member of parliament, member of the scottish parliament and member of the european parliament to have seek compensatory redress against those fibbers in perren street, and i will not waver from my cause until reparations are made. 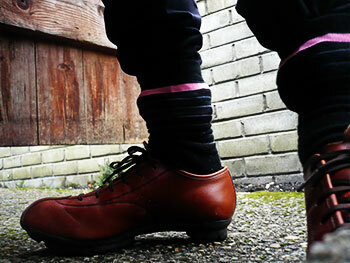 another three pairs of city riding socks ought to do the trick. rapha's city riding socks are available in black with pink trim, morroccan blue with white trim and fig with yellow trim in sizes from small to xl for only £s;15 per pair.